Europe's youngest capital, Cardiff is small enough to explore on foot with most of the bars, night life and attractions centred around the city centre. It is never too difficult to spot an accommodation option of your choice. Cardiff has a range of options such as hotels, B&Bs, self catering cottages and budget hostels all within a short walk from the city centre. Travelodge Cardiff is located at the St Mary’s street amidst an array of party hideouts for stag and hens. Cardiff by the bay is enticing. Bay side accommodation is well cut for night life and clubs and bars whereas the self catering cottages in the beautiful Welsh countryside will be better suited for all the activity pursuits and outdoor fun. 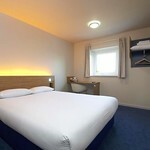 Mid range hotels like Travelodge Cardiff at the St Mary’s street offer comfortable stay and food at cheap rates. After all, you will be spending most of your time outdoors and all you need is comfortable place to while away your night. These no frill accommodation options offer clean beds and linen and ensuited rooms to complement your stay in the Welsh capital. Cardiff loves nothing better than to party, and the hen nights can never get any better than the Welsh variety. This small city with a big reputation and the friendly local populace will make you feel spoilt for choices. The warm cosmopolitan flair of the bay side ,Greyfriars road and the weekend party fun on cards will all make this city crowded and the accommodation options can get booked up pretty quickly. Check out our budget package deals that combine accommodation with night clubs or party bus and save a pretty penny. If budget is what matters, we suggest hostels or dorms as they offer basic amenities for big groups for a song. Well suited for non fussy hens who are open to a no frill accommodation. Self catering or catered apartments are well cut for noisy hen groups who love to have a space of their own and freedom to howl and whistle all night without annoying the neighbours. Most hen friendly accommodation offers perks like late check out options, transfer deals, meal passes and VIP club passes. Give us a call, let us know your group size and budget and our team can come up with some of the best accommodation options for you.